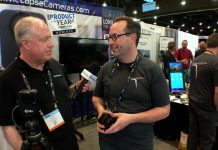 At NAB in Las Vegas, a partnership is giving video professionals (among others) access to relatively cheap long term storage, with some new benefits. Doug Hynes, Senior Director of Business Development for storageDNA, and Dan Montgomery, President of Imagine Products, discuss the benefits of LTO tape, and enterprise-grade solution for storage and media backup that is cost-effective and fast. Doug and Dan talk speeds, capabilities, and some of the capabilities that their partnership add to this kind of storage.